Last post, I mentioned seeing a huge steel framework perched atop the support columns for what will be Tukwila Station and the associated track headed north. Owned by PCL Construction Services, it hoists about ten trackway segments at a time between sets of support columns so they can be put into place. PCL's web site has images of what the trackway they're contracted to build will eventually look like, but what I'm more impressed by is what it looks like now - with the first trackway section erected this week. Tukwila will be the southernmost stop in the initial plan, with Airport Link (and its excessively amusing "Kiss and Ride") to follow six months later. As far as I'm concerned, though, this is the most impressive segment - sharing right-of-way with I-5 and SR-518, it's highly visible to many of the people who will use it. This brings me to some new speculation: What's quite effective as a local service on MLK for South Seattle is not particularly desirable as part of an express service to the airport and further south. Let's look back at that initial plan. Headed south from downtown, Link turns east through Beacon Hill, and meanders along with an eventual return to the Duwamish River valley. I can understand that for a first segment, serving as much local population as possible is key, but as a regional system, eventually we'll want to offer service that doesn't stop everywhere (and isn't limited to streetcar speeds) for people going between major destinations. So, perhaps, there's an option opened up by the valley. An express link could bypass the Rainier Valley, continuing straight where the trackway turns to go under Beacon Hill, and reconnecting before the Duwamish River crossing - perhaps using 4th Ave and Marginal Way. Local service could extend from Ballard (note that rail link on the long-range plan map) through downtown to MLK, then rejoin the main line in Tukwila. Express service would come in from north of Seattle, bypass MLK (perhaps with one or two stops near Boeing Field) and continue south. You wouldn't have to call these local and express. They could be "Blue" and "Green", or they could have local unique names like "Duwamish" or "Walla Walla". I do see some problems with this, of course: the expected multimodal station at Boeing Field would only be accessible by one line, confusing some passengers - but someone starting in Seattle wouldn't need to transfer there, and someone at Sea-Tac would simply take the local (MLK) train. By the time this happened, we'd probably have 3 minute headways all day, so it wouldn't be a significant addition to travel time. But those are the rantings of a mad transit advocate. Japan does this between Narita Airport and Tokyo - there are several train types: some continue beyond Tokyo Station, some serve communities between the airport and downtown. Interestingly, as soon as Airport Link is completed, we will have more frequent service and lower travel time between our international airport and downtown than Tokyo does to Narita - at significantly lower cost. I think it is great to see more of the line coming to fruition. Also this week, the small 1.6 mile Tacoma LINK came close to proving it's worth. On Nov. 30th, Pierce Transit came close to being 60 buses short for their morining peak schedule. Their CNG Fueling facility went down, and they had to call up some diesels out of mothballs, while working through the night to get those pumps fixed. Also, ST first issued a rider alert advising those who ride ST 590 to Seattle to take SOUNDER. If they had not got those pumps fixed, RTA critics would have been at a loss for words. Those "only an alternative in the RTA's own words" actually worked as ST Tacoma-Seattle routes were out of gas! Your Local/Express idea for Light Rail would work, although Dori Monson would not like that. He thinks Community Transit's recent adoption of Bus Rapid Transit(at the expense of local service on Aurora) is the way of the future. Well, if the RTA did adopt Express Light Rail that bypasses Ranier Valley, it would be going somewhere. Also, as long as there is a line down Airport Way. why not have one go down Interurban Ave as well, following the route of the old Interurban as much as possible, serving Kent, Auburn, and other communities before pulling into Tacoma, complementing SOUNDER and local bus services. Let's start finding new funding sources that will help pay for improved transit. Electric Transit is the way to go, and we have a good start, but not much of one. Philadelphia's system once again has fallen into stagnation, but they have the potential of being the least fuel-dependent system in the country. They have all the Regional Rail(we call it Commuter Rail here) electrified do to a tunnel connecting the Reading and Pennsylvania RR networks. SEPTA also has a few Subway/Surface Light Rail operations(using small single-unit streetcars, not heritage types), 1 Streetcar Line using rebuilt PCC Cars, a small subway system(again electric), 3 Suburban Lines that are holdovers from the Interurban Era, as well as a few Trackless Trolley routes. Philadelphia should be a model, and expand all of those parts of the SEPTA system. We also need to have the option for cities to be able to fund their own transit improvements that complement other county and regional transit systems. Rebuild and expand the Waterfront Streetcar and connect it with the South Lake Union Line, and we can start a small streetcar system, and brand-name it the Seattle Municipal Street Railway. I heard about the CNG fueling facility having an issue. I got the warning from Sound Transit for 590 riders. I'm not familiar with Dori Monson. I'm not a big fan of BRT except as a way to get ROW. I think that a lot of politicians support BRT via HOV because it can be converted back to general purpose if transit "fails". I'm not too sure about an interurban route. That's exactly the route the Sounder already takes - why not build the third main instead, and electrify it? Dori Monson holds down Noon-3PM on KIRO. He has been using his show to wage a war of transit ideology against Sound Transit, and Ron Sims. Rarely has his facts straight, calls Sound Transit Ron Sims's pet project, and thinks that making Lake City Way an Expressway will help him get to work faster. At least in San Francisco, RescueMUNI is a group that is favoring expanding all modes MUNI uses, even the Cable Cars. They are not pushing one mode over another. It's interesting if SOUNDER does not work, then why are they planning in ST2 for more parking at just about every station? Tacoma LINK will get at least one extension, and perhaps Pierce Transit reconsidering their faith in CNG. They already use Gasoline as a fuel for BusPlus and SHUTTLE services, why not buy Gasoline-Electric Hybrids from New Flyer, and Pierce Transit should consider building thier own streetcar network? Electrifying the main-line for not just SOUNDER and AMTRAK, but for Freight operations too. North Seattle has the Density to support and grow a couple of Light Rail lines. Ballard, Aurora/Phinney Ridge(the route of the old Interuban), and the Central LINK routing through Roosevelt bound for Northgate. Also, to complete this grid, there would need to be connecting lines. A Streetcar on 45th St might work, but for 85th, 105th/Northgate Way, perhapas a series of Rapid Trolleybus lines. I-5 could be the Express Route through North Seattle, but to reach Convention Place Station, the I-5 Express Lanes may have to be sacrificed. Los Angeles is actually, despite Dogged Attacks by the Bus Riders Union, managed to build 71 miles of Light and Heavy Rail(akin to NYC SUbway, minus express track). More is under construction, in the case of the Gold Line LRT to East LA, or under planning, in the case of the Expo Line LRT. There is also some advocates pushing several branches and extensions for the Green Line, which runs in the median of the I-105 Freeway between Norwalk and Redondo Beach, passing within a mile of LAX. The Transit Coalition proposes connecting the Green Line with LAX, amd much, much more, plus a direct line from LAX to LA Union Station. The Metro Rapid System that came out of the BRU Consent Decree, feeds the rail system that the BRU hates so much. Also, until another line is ever built through Downtown, the Red Line serves a big purpose down in LA, it connects North Hollywood with Downtown, but it also connects LAUS with the Blue Line Terminal. The GOld Line is not connected to the Blue Line. LA was hoping to eventually build 400 miles of Rail Transit, but they may be getting close to 100 miles of it in LA County within the next 20 years. 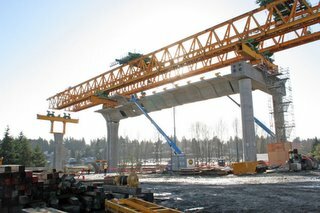 I remember a few years ago, then King County COuncilmember Maggie Fimia was attacking LRT because it went from 110 miles, to 80 miles, to 24 miles, to the current 14 miles under construction, wondering what happened. Sound Move, the 21 miles that were authorized was what the voters would authorize. It would be at least 120 miles of LRT in the region to provide a network of lines(with transfers) that would take people from where they live to where they want to go. crossover tracks North of each station. Could allow for express trains.